In a bowl, squeeze sour limes & extract juice. Add a cup of water to it & stir well. Add gelatine to it & let it soak for 1 hour. In a sufficiently large pan, add ½ cup of water to sugar. Place the pan on med. heat & keep stirring till the sugar dissolves completely. Stir in the soaked gelatine till dissolved. Let the mixture come to a boil. Add edible color & essence. Stir well till well incorporated. Gently pour the mixture in a greased container. Let it set for about 5 hours. Cut into small cubes or any desired shape. Roll in granulated sugar & place on a tray to dry for another 2 hrs. Place sufficient granulated sugar in a deep bowl. Put in few cut jujube cubes at a time. Toss the cubes till it is completely covered in sugar. 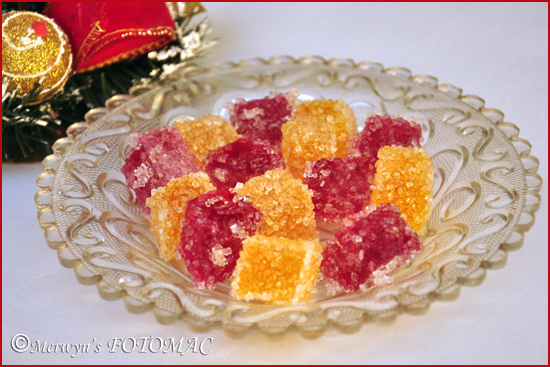 You may make several batches of jujubes using different colors & essences. You may even divide the above mixture in two sections & make two different flavors. You may use a glass dish or aluminium container to set the jujubes. Thanks for the very descriptive recipes. Would you be able to post a recipe for Neurios and Kulkuls as well. Everytime I make the neurios, they turn out soft, can you let me know now to make them crisp? Hi Hilda, very nice recipes and detailed well. Do you do your own puff pastry for Beef patties?